(Please bear in mind that 15.8% resolution is despite the fact that IE still don’t have IDN support – Michel told me it will be in IE 6 beta 2 ie in IE 7 release.) I also got a t-shirt (see pic on right) today from Pete Risnick (thanks!). 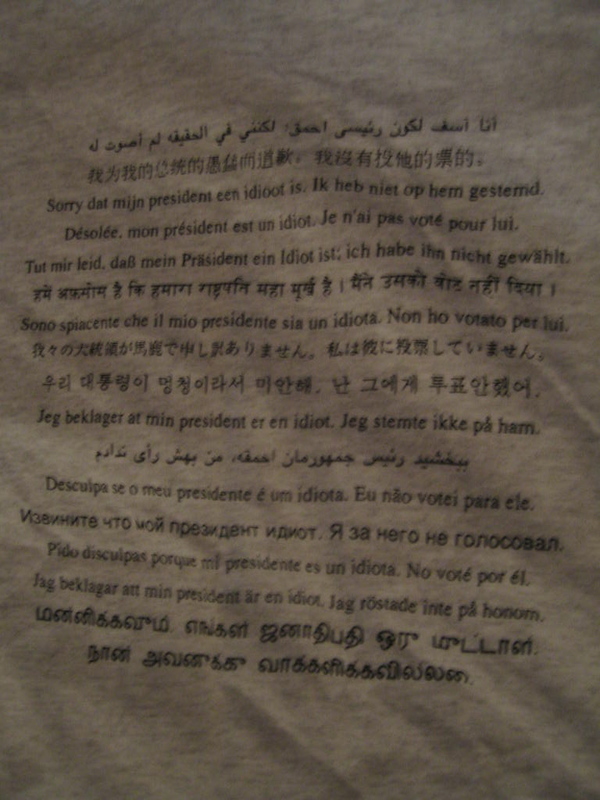 It basically say “We are sorry that our President is an idiot. We didn’t vote for him.” (see related) in several language :-) hahahaha. Today is a slow day – the only meeting that interest me is MASS or basically DKIM which is derived from Yahoo! DomainKey. The goal of DKIM is to provide a mechanism to validate an email comes from the said domain with minimal changes for end-users (ie no client upgrades) (with the hope of cos, to provide a tool against spam and phishing). The problem is that identification technology != antispam or antiphishing (See my previous post). A technical study by the security area comes to the same conclusion. As such, people concern that (1) DKIM may promise to solve a problem it cannot hope to solve (2) the damage DKIM may bring to the email system esp. with uncertain benefits. All these are valid concerns. However, in my opinion, while DKIM may not be the silver bullet to solve spam problem, the ability to authenticate email is a piece of the puzzle. More generally, forgery is a bad thing and anything we can deploy to reduce it is a good thing. So regardless whether it can actually stop spam or phishing, we should proceed with it. Anyway, after two hours, a little progress was made and looks like a working group wont be charter until Yahoo publishes their Intellectual Property statement on DomainKey (the only IPR known related to DKIM) in Sept. 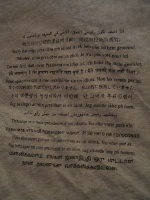 This entry was posted on Thursday, August 4th, 2005 at 4:03 pm and is filed under IDN, IETF, Travel. You can follow any responses to this entry through the RSS 2.0 feed. Responses are currently closed, but you can trackback from your own site.